The Philippine Atmospheric, Geophysical and Astronomical Services Administration (PAGASA) is the Philippine’s national weather service. PAGASA has issued a dire warning for our region: “Harsh April El Niño for Guimaras & Western Visayas.” We’ve already instituted strict water conservation measures for our home in Guimaras. El Niño is a large-scale weather phenomenon that develops in the Pacific Ocean. In the Philippines, drought/dry spell events are associated with the occurrence of El Niño. El Niño translates from Spanish as the “Boy Child” or the “Little One”. My asawa has been watering her plants for months now. We’ve only had one rainfall in the past few weeks. My hardworking spouse was also carrying buckets of water to our swimming pool. I was helping her with that arduous task when I suggested we find an easier way to fill the pool. While we had been running a hose from a water outlet in the back of our home to replenish the pool levels, it wasn’t providing enough water fast enough. The water bucket delivery system was too demanding. Therefore, we decided to run a house from one of our two wells and pump the water into the swimming hole from the well. 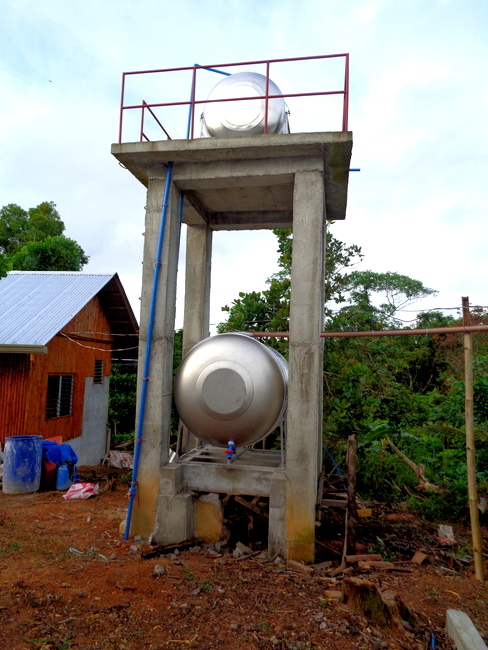 Consequently, setting up a new pump to deliver the water would require the assistance of our brother-in-law, Joery. Unlike me, Joery is extremely handy. 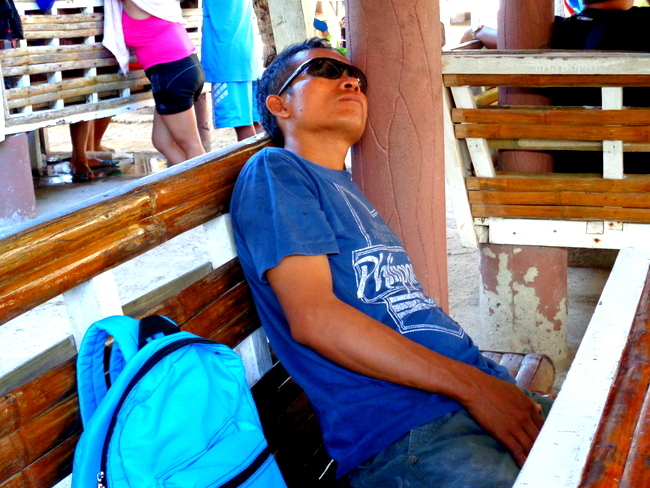 That’s him in the next shot, taking a well-deserved nap at Raymen Beach. Joery came over late one Sunday afternoon and tried to set up the new pump arrangement. We had already purchased 75 meters of hose. However, our brother-in-law informed us there wasn’t enough water in the wells to pump into the pool. Furthermore, Joery determined that in order to pump any more water for our personal needs, drinking water, washing dishes and bathing, he would need to move our existing pump closer to the well that provided our drinking water. 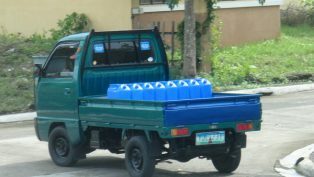 Because I wasn’t going to pay a water truck 2,500 pesos, 50 US dollars, to deliver a load of tubig (water) to our swimming pool, I proclaimed the swimming pool closed until the rainy season. It would take two loads to fill the pool. Last year my wife ordered one water delivery in the beginning of May. Then it rained. Above all, one load of water only raised the pool level four inches. It wasn’t worth it to me. In addition, I save money on not running the pool pump. In fact, we have saved over 2,000 pesos, 40 US dollars, over last month’s utility bill. I also save money on chemicals, as I’m able to maintain decent water quality with a minimum amount of chlorine every week. Hence, closing the pool for our drought conditions was water conservation step one. We have a 21-year-old niece that lives with us. It takes her about 30 minutes a day to take a shower and wash her extremely long hair. It takes her 18-year-old brother just about as long. Consequently, all showers are now banned in the house for everyone. Both kids have to go outside and bathe by the one well we use for doing the laundry and watering the plants. My wife brings in water for our showers and to flush our toilets with. She reuses the water used for her hand washing for the toilets. Our niece and nephew bring in water for their individual Comfort Rooms, CRs. The only running water allowed in the house is for washing our hands and to wash dishes with. Since the severe effects of El Niño will be felt in almost all parts of Western Visayas by April 2019, we’ve instituted these water conservation measures. “Almost all of the provinces in the region will experience dry spell and drought by April brought about by the El Niño phenomenon,”said Ronaldo Naragdag, weather specialist of PAGASA. That’s according to a report in The Daily Guardian. Based on the climate outlook of PAGASA, three areas in Visayas namely Bohol, Cebu, and Southern Leyte will experience a dry spell. However, Aklan, Antique, Capiz, Guimaras, Iloilo, Negros Occidental, Negros Oriental, Siquijor, Biliran, Eastern Samar, Leyte, Northern, and Western Samar will experience drought by the end of April. Naragdag said that the El Niño that is hitting the country and Western Visayas is not yet “full blown” and is categorized as a “weak” El Niño. While they expect the El Niño to heighten by April, PAGASA said the El Niño would subside in the following months particularly in June. Furthermore, PAGASA states on their website that El Niño events will often be preceded and/or followed by La Niña. La Niña oftentimes brings above average rainfalls. We experienced this last time we were hit by El Niño a few years ago. We’ll continue our water conservation efforts until well into the onset of the rainy season. Hopefully, sooner than later.